We don’t get the best weather in the UK even during the summer months. In autumn and winter especially it can get especially wet and miserable out there. This has increased demand and requests for us to recommend some waterproof products for our readers. We’ve been lucky enough to have worked with many brands and tested over 50 waterproof beds for dogs to give you the ultimate list of our recommendations. After careful consideration and hours of testing we feel that the winner of our best dog bed winner is also the best waterproof bed. The PetFusion memory foam bed is simply amazing in terms of comfort, style and return on investment thanks to its superior build quality, orthopaedic support and of course the fact that it’s very water resistant. You simply can not go wrong with this superb bed and your dog will love you for it. Who would want a water-resistant bed? The PetFusion is one of the most luxurious and popular large waterproof beds on the market with almost 1,000 positive reviews on Amazon. It’s been made using premium materials which are, of course, waterproof and durable. The bed’s got a superior comfort level which is what separates this from most of its competitors. The reason why this bed is so good is not just it’s because it’s waterproof but because it’s orthopaedic with memory foam technology to it evolves to fit your dog. It’s got machine washable covers so even if you get liquids on it it can be easily cleaned after. The covers are not just water-resistant but stain resistant as well. This is an essential feature as waterproof dog beds are pretty much aimed towards dogs who live and play in the country who regularly get dirty. The bed itself is extremely comfortable with raised arms around the edges to allow your dog to feel ‘enclosed’ or they can use to rest their chin. This is a thoroughly modern bed which not only tops our best dog beds table but our best waterproof beds for pooches list as well for the exact same reason. Ellie Bo are perhaps most known to use as manufacturers of dog crates and cages. However, they also make other products and accessories which includes this waterproof dog bed. If you’re after a waterproof bed that doesn’t have any gimmicks and perfect to fit inside a dog crate (funnily enough) then the Ellie Bo waterproof dog bed may be the one for you! This bed doesn’t have a plastic outer layer to “spoof” being water resistant. Instead, it has an oxford weave instead which is both waterproof and durable. This could be classed as an indestructible dog bed that is also waterproof. It feels rather classy to touch similar to the material used in country life coats. The cover is removable and machine washable which gives it years of life. The fluff in the middle of the bed is partitioned which helps reduce the bed becoming uneven with regular use – this is an important feature as it does not use memory foam. As you may have guessed, the Ellie Bo Waterproof bed is designed to be used primarily with Ellie Bo dog crates, that’s why it’s shaped like a square. However, it can be used independently but it does lack the raised edges and an ‘enclosed’ as some purposely designed beds out there. Bare this in mind. To conclude, this is one of our favourite cheap dog waterproof beds thanks to its well-made structure, the high-quality feel of the material and outstanding waterproof performance. If you use a dog crate then this bed gets promoted to the best waterproof bed as it literally fits like a glove. Removable, machine washable waterproof outer cover made from Oxford weave. Here’s a waterproof bed that looks like a normal bed for many readers. This bed uses the ‘enclosed’ style which is what dogs typically like as it makes laying in it ‘cosy’. This bed uses Oxford fabric which is easy to clean, tough and what makes it waterproof as opposed to cotton. The All Pet Solutions bed is not a one piece – it has a removable cover which is machine washable which is essential for a bed which is designed to get wet and dirty on a regular basis. What we like about this bed is how good it is even when you disregard the fact that it’s waterproof. It’s comfortable for our Jug, Jeff, when he tested it and had no trouble at all sleeping when we had it in the house. The non-slip bottom made it not slip around on our laminate floor and kitchen tiles where we commonly keep the bed on a given day. The price point is extremely generous, too, which really gives it an edge over most competitors and allows this to be one of the best budget waterproof beds you can buy in the UK. There are three colours and four sizes to choose from to it’s suitable for most breeds and the colour choices should please most tastes. To conclude, there’s not much to not like about this fantastic bed which has a removable cover that’s waterproof. It’s cheap, looks great, is very comfortable and backed with over 30 positive reviews! Check it out! The cover is 100% machine washable. The Dog’s Bed by The Dog’s Balls is a traditional flat surfaced dog bed with a water-resistant Oxford material and an added coating which also makes it chemical agent and abrasion resistant. We think they’ve blemished this description a little as when we received a tester model it was pretty much the same material that is used on the majority of waterproof dog beds. It’s not the cheapest of beds we’ve got on this list but it is one of the most versatile bed with a very good return on investment. As far as the bed itself is concerned it’s really big and quite comfortable to lay on. It’s filled with a dense, fluffy foam mattress surrounded by a long, replaceable, pillow filled with dacron. Comfort and safety are at the forefront of the design and their efforts to show as it’s one of the best shaped and comfortable waterproof dog beds we reviewed. The double stitching design makes the best tough and durable, to the point where it could be a good choice for an indestructible dog bed. Because of its large square shape, this is a popular bed with owners who are crate training and operators of boarding kennels. It’s easy to clean, too, thanks to a wipe clean surface and removable covers and pillow. Lastly, there are several sizes available to buy and it comes in 5 colours – biscuit, grey, black, brown and green which will suit pretty much any decor. 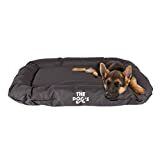 To conclude, The Dog’s Bed Water Resistant dog bed from The Dog’s Balls is a quality waterproof dog bed which is easy to keep clean, very comfortable and has a versatile shape. It’s not the cheapest but it is one of the best! The P&L Superior Heavy Duty and the Waterproof bed is one of our favourite dog beds in the world, ever. The fact that it’s waterproof and water-resistant is just one massive bonus and if anything an excuse for us to get it mentioned in yet another best dog bed list. Even just looking at the picture of this bed should be enough to make you want to buy it! Anyway, let’s discuss yet again why we feel this is one of the greatest waterproof dog beds. The reason we feel that this bed is one of the best around is that of how comfortable it is and how tough it is and how much value for money you’re going to get from this beast of a bed. The material used is 100% polyester which is moisture wicking and aqua resistant – this doesn’t use oxford like many of the others and the bed feels more akin to a water proof coat that you or I would wear as opposed to a bed. This may make the bed sound uncomfortable, and perhaps it is, but because it’s so deep if you chuck in a nice blanket it becomes seriously toasty. This an ideal bed for dogs who get wet and dirty on a regular basis. It’s easy to clean with a rinse and wipes and for any debris, they can be swept away as the material is tightly stitched. The thick base cushion is also removable to make it even easier to clean and tidy. 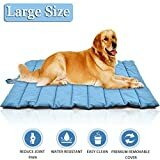 The high walls are lined with thermal polyester which keeps your dog cool in summer and hot in the winter making it an excellent all year round bed. The high walls also keep your dog protected from draughts. There are three sizes available medium, large and jumbo. The colours available are black, black/grey, blue, green, brown, burgundy, sand, grey and brown/sand. These are all quite neutral colour which would fit in to pretty much any home. We recommend the darker colours as they hide the dirt a bit better. To conclude, the P&L Superior Heavy Duty Bed is just as the name implies – superior. It’s high walls and thermal polyester make it one of the most comfortable beds for your pup. The polyester outer lining makes it indestructible and waterproof which is perfect for dogs who love to get wet. It’s not the cheapest bed in the world but to be fair it is not expensive to consider the size of the bed. We thoroughly recommend this large waterproof dog bed to any dog owner. It wouldn’t be a complete list without a product from Bunty and what a product it is. The Bunty waterproof mattress is a similar product to the PetFusion memory foam mattress in so much it has a similar shallow bed with raised walls for comfort. However, it isn’t an orthopaedic bed but it is a very comfortable waterproof bed to consider for a fraction of the cost if you’re on a budget. This Bunty cosy couch sits at the top of the food chain in Bunty’s range of dog beds. The entire bed is waterproof without a removable cover so it isn’t machine washable but it is easily wiped down. The canvas is fairly tough and can take a beating. The stitching is high quality to reinforce the strength. The outer rim is polyester to allow them to rest limbs or they weary head during a snooze. The base of the bed has a huge wedge of 4″ foam to take the weight of even the heaviest of pooches with an anti-slip bottom which makes it work well on laminate or tile even on rainy days. The waterproof aspect is superb and the water simply wicks away. The tightly woven material doesn’t allow any water to permeate which protects the foam giving you a bed that will last you a long time. This is a large waterproof bed that doesn’t have a large cost. To conclude, this is as good as it gets towards a luxury waterproof bed on a budget. It’s probably not the best but it is a useful product to consider when comparing and contrasting with the leaders. The base is made from high density super thick 4" foam, this will cope with even the heaviest of pets making it feel like they are on cloud 9. The Purple Pets Water resistant pet basket is an excellent alternative dog bed to consider for those looking for a solution that’s focused on both waterproofing, stylish good looks and comfort at the same time. What we liked about this bed the most was the different bright colours available which make it the least boring bed we’ve reviewed by a country mile. Believe it or not, this is a big breathe of fresh air amid products with neutral colours and something many dog owners may appreciate as it won’t dull their homes. The materials used to make it waterproof are soft to touch and woven tightly to wick water away when it makes contact and to not allow any liquids to permeate and ruin the inner lining. There are 5(!) removable padding pieces which makes it very easy to clean and tidy but it does make it a little bit of a chore to sort and keep a track of. This is an ‘enclosed’ style of dog bed with raised sides to allow your dog to flop over and rest their limbs/chin whenever they want. This is a particularly good feature if the bed will be used inside of a dog crate so that there’s less contact between the dog and the mesh bars. The colours available for the bed are lime green, blue, orange and green. The colours are all very vibrant and similar to the colours you’d find as energy drinks. Our favourite was the really bold blue they have followed by the lime green. The covers are reversible so you can swap the coloured side with a black cover at any time. This can be very handy to hide stains. Purple Pets have kept their sizes simple with small, medium (50cm x 60cm, 30cm), large (60cm x 80cm x 30cm) and extra large (80cm x 100cm x 30cm). Although small was not available at the time this review was written. The Extra Large is designed for breeds such as Collies so this is not an idea large waterproof dog bed for giant dog breeds, sadly. This is a really comfortable and colourful bed which suits usage with or without a crate. It is totally waterproof and very comfortable for your dog. The raised sides are of the perfect height to make the bed more of a hideaway than a flat piece of cushion. The price point puts it more towards the expensive side but not to the point where would say it’s actually expensive. This is a bed we recommend using to compare with your favourites. DURABLE WATER-RESISTANT NYLON FABRIC IN 4 COLOURS - choose from fluorescent Blue, Lime Green, Orange and Dark Black against a neutral grey colour. Purple Pets beds are built to cope with spills, splashes and frantic dashes. SMALL, MEDIUM, AND LARGE DOG BEDS/CAT BEDS AVAILABLE - Whether you've got a sleepy spaniel or a lazy Labrador, we've got the perfect sized spot for your pet to flop. Small beds are also great for cats as well as small dogs such as a Pug and Shih Tzu sized dogs. EASY CLEAN, WITH 5 X REMOVABLE PADDING PIECES - simply unzip each compartment, take out the padding insert and hand wash the bed and padding in warm soapy water. Then all you need to do is hang the washed parts out to dry. TOTAL COMFORT - At Purple Pets, we design for dogs, rather than owners. Many dog crates have rigid sides, but ours provide soft support, so your dog can flop across or curl up inside in comfort. And since maximum flumping is crucial, four studded air holes in the bed pillow allow air to escape when your dog sits down, so the softness can surround them like deluxe cushions on a sofa. Who’s up for an odd looking memory foam waterproof bed instead of the usually enclosed basket versions? We do! And perhaps you might as well once you read our review! Anyway, this is a fully fledged memory foam dog mattress which offers orthopaedic support and superior comfort. And the best part? This is a very cheap bed considering the premium rate materials and the fact that it’s waterproof! The waterproof aspect comes from a removable cover which can be wiped clean or machine washable if it gets very wet and dirty. The underside has a non-slip skin which makes it perfect for rooms with laminate, vinyl or tiled floors. The feel of the materials is high quality and when we let water on the bed it simply wicked off and did not permeate through the tightly woven nylon cover. The bed itself has two removable cushions which are a market first in the world of dog beds. We found them to be not just quirky but actually rather useful and Jeff seemed to really like to lean his chin on the sides. They also make the bed a bit more comfortable if you placed in a dog crate because the sides reduce the chance of the dog touching the mesh. This is a large waterproof bed which at time of writing was not available in any size other than 90 x 70 x 20 CM. If you have a small dog this will be spacious but if you have a larger breed then this will be perfect! There is only one colour available which is boring grey but snazzy orange piping is present which your dog’s limited colour spectrum can see. 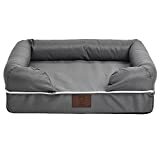 To conclude, the UrPet Waterproof Memory Foam dog bed is a superb choice for anyone looking for a bargain as you will be hard pressed finding a cheaper bed which is both orthopaedic and waterproof. However, it probably is not suitable for smaller dogs as the bed only comes in massive! Premium Components: (i) Solid Memory Foam base for superior overall comfort, reduced joint pain and improved health, mobility and energy. Unique Design: Base and removable cushions provide exceptional support and comfort (ii) Water resistant and tear resistant cover. No other bed on the market has removable cushions. Chique: Non-skid base for hardwood and tiled floors (o) The Grey cover with orange piping blends in seamlessly with your décor. Easy to Clean: Removable zipper cover is machine washable but also simple to spot clean and remove hair with just a wipe. Please tumble dry on gentle setting. Do not use bleach when washing. Elevated dog beds are becoming a popular choice with modern dog owners as many find their dogs enjoying laying down on them more comfortable than some traditional beds. This is because they find the floating aspect to be relaxing. For us dog owners we get a stylish dog bed which is easy to maintain and doesn’t cost the earth. Of course, this bed is also waterproof which is why it’s on this list! The metal frame is also rust proof so there’s no need to worry if water gets anywhere near this fabulous large waterproof bed. The Bunty Elevated bed is a four poster metal frame with extremely strong weave fabric which acts as the main part of the bed. This really strong and stretchy fabric is breathable and keeps your dog cool in the summer and warm in the winter months. This tightly woven sheath is also moisture wicking which can be wiped clean and dried very quickly. This bed dries up quickly which makes it the dog bed which is the most water resistant and waterproof we have reviewed as a result. Because the bed is raised this reduces the risk of the cold floor seeping into the fabric. This bed keeps a dog warm because it avoids the cold as opposed to harvests it with traditional sponge and foam filled beds. It looks basic and some people think it looks a bit crap but believe us when we say your dog will think otherwise. The Bunty elevated dog bed can also be moved outside to be used as an outside sun lounger as the metal is and materials are impervious to the great outdoors. Of course, it doesn’t fold flat so it’s not suitable for transportation but it is suitable for use in a garden or patio. 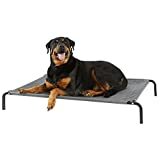 If you really wanted to, you could actually put another bed on top of this if you wanted but we don’t think you’d need to once you see how much your dog loves this. You’ve got a choice of three sizes and one colour so not much going on there. One complaint we did have is that this bed can take a big chunk of your living space and because it’s made using a rust resistant powder coated paint it can be painful if you knock into it. It’s also not compatible whatsoever with dog crates. To conclude, the Bunty waterproof elevated dog bed is probably the ultimate bed for all weather which can resist being wet. We understand it looks daunting to us and perhaps a little uncomfortable but believe us when we say your dog will not agree. Its price point is also very generous and one of the cheapest waterproof dog beds we have tested. Lifepul is another brand that makes a variety of dog products and understands dogs a bit better than most. With the pet mat, they’ve gone for a product that’s definitely different which offers a very versatile alternative to beds and baskets but ultimately something comfortable for them to lie on which is waterproof. Without further ado let’s take a look at why the Lifepul pet mat is worth your business. So, first things first – this is a pet mat and not strictly a bed with raised sides. The mat has ridges which make it comfortable and help keep the shape and evenness of the inserts. It also makes it much easier to fold up and transported when not in use. The mat, when laid flat, is as comfortable as any bed. The only thing that lets it down is its lack of raised sides and ‘den’ like feel. However, it did not look like our dog minded this at all! The material is of a high-quality soft polyester which is machine washable and easy to wipe down if you’d rather. It’s moderately thick and breathable which makes it an ideal bed for all seasons and temperatures. It looks great in the only colour available (blue) with a black underside which you can swap if you wanted. The stitching on the pet mat is superb and you can feel that this product will last you a long time. This is a new product but has already garnered over 10 positive reviews on Amazon so far. The biggest USP of the Lifepul pet mat and one that no other waterproof dog bed we’ve reviewed and rated has is its massive versatility and ability to be used anywhere! You can roll this up and take it outside into the garden or your local park. You can use it on your sofa or inside your car when travelling or you can, of course, use it at home like a normal dog bed. The Lifepul would also work well with dog crates. For the price, you pay you to get an awful lot of different uses here. To conclude, the Lifepul pet mat is a seriously viable and versatile alternative waterproof dog mat which can be used in all manners of situations for a frighteningly low cost. It might not look like your typical dog bed but take it from us when we say that it works just as well, if not better, than most other water-resistant dog beds we’ve reviewed. A waterproof or water resistant dog bed is a product designed to allow a dog to sleep, sit or relax in that’s either made wholly or has a removable cover that does not allow water to permeate through into the inner layers. Typically, a waterproof bed is made out of tightly wound polyester, nylon or oxford weave that does not have holes in the material which allows the water to seep through. A waterproof dog bed still retains most common designs and traits of a regular dog bed with the difference being the materials used. A waterproof bed may simultaneously be an indestructible dog bed as water resistant materials are usually quite tough because of tightly woven materials. There are plenty of people who would benefit from a water wicking dog bed. A bed which is water resistant is also more likely to last you longer due to the reduced impact that water can cause over a period of time especially to the bed’s structure and inner layers. We have carefully reviewed over 50 waterproof dog beds over a period of 5 months. During this time we began to understand quite clearly the difference between a good waterproof bed, a bad one and a great one. Which one is the best is subjective to your situation, your budgets and of course your dog. All we’ve done on this page is give our opinion on what we felt during our time testing the bed. However, we do feel that out of the 10 beds on this list one of them will be perfect for 99% of our readers! All the beds we recommend on this list are different in their own unique way but we wanted to make sure we could compare them fairly. Here we explain what kind of features we feel should be present before you make a purchase online. We feel a dog bed needs to be able to wick water off the surface to be classed as a water resistant bed. Wicking water means that the water ‘falls off’ the surface and doesn’t permeate through the first layer and then soaks the water up. Without this tightly woven layer, it wouldn’t be a waterproof bed at all so make sure it is definitely made with this feature. Nylon, polyester and Oxford are all good materials to have. Not many people would think to look and consider a dog bed’s stitching but when we were reviewing beds we noticed how important a good stitching job did to the toughness of the bed. A bed designed to be hammered by mucky pups is going to be put through the wringer (figuratively, not literally) by both the dog and by you if you wipe it down or machine wash it regularly. If the bed has been stitched together poorly then prepare for your bed to be torn apart quickly. We recommend reading the reviews and product description fully to find out if the quality of the stitching has ever been questioned or commented on. Your waterproof bed WILL get dirty and because of this you need to make sure that you can either wipe it down easily, machine washes the whole bed or that it has a removable cover that can then be machine washed. If you can’t clean this bed from time to time then you’re going to have a filthy, smelly bed in the house that may even end up being unhygienic making your dog potentially sick. Most of the beds will be washable but not all so make sure you’ve read the product description and any reviews to find out if the one you want to buy can. Some people might be expensive things because they are expensive but provide no better experience or investment than an identical product for a much cheaper price. Always make sure you’re getting a good deal by checking its nearest competitor brands who make a similar bed. Checking the reviews against each other can also be useful to confirm a similar performance. When buying any product, not just waterproof dog beds, you should always check to see if the product has positive reviews and the manufacturer also has them. Even if we’ve given something a stellar review it shouldn’t be taken as gospel alone. This can be quite tricky for products that have never had reviews which could turn out to be great products, though.